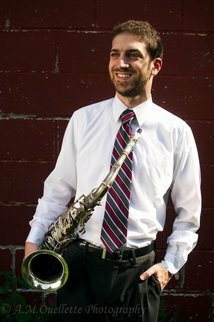 Joe Natale (Saxophone, beginning piano) was born in Syracuse, NY and raised in Yorktown Heights. Joe developed an interest in music at an early age and started playing clarinet in elementary school band. He discovered the saxophone and his passion for jazz, and at 13, he enrolled at Lagond Music School in Elmsford, NY where he had the privilege to study with such luminaries as Charlie Lagond, Jon Irabagon and Kris Allen. Joe has a undergraduate degree from The Hartt School of Music and a Masters degree from The State University of NY at Purchase. He has had the opportunity to study and play with accomplished musicians such as Ralph Lalama, Rene McLean, Abraham Burton, Jimmy Greene, Doug Munro, Richie Morales, Jon Faddis, Kris Allen, Todd Coolman, Andy LaVerne, John Abercrombie, Nat Reeves, Steve Davis, Christopher Casey and many more. Now's the Time by Charlie Parker. It was the first song where I heard someone improvise. I was blown away by the fact that someone was able to just make up music on the spot, and I wanted to try to do it too! Charlie Lagond was the teacher that helped me cultivate my passion for music during middle school and high school. He is the one who instilled my love for performing. He also introduced me the jazz music and how to improvise. I would not be where I am today if it weren't for him.